At Antique Furniture Direct we sell a range of antique pictures including antique oil paintings, antique prints and antique watercolours. We try to stock antique pictures which are decorative and well executed usually with attractive gilt frames. 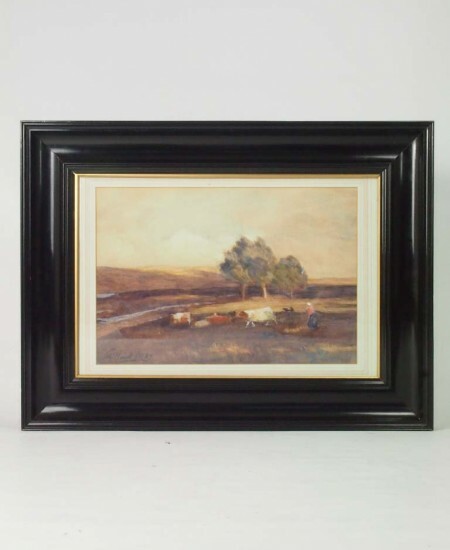 We sell unsigned as well as signed antique art including portraits, still life, landscapes and seascapes. When buying an antique painting you should consider a number of issues. What is its condition? How well has it been executed? Is it signed by a recognised artist? Often the back of a painting has quite a lot of information on it. It may have old catalogue labels showing where it has been kept and displayed. The framers name is frequently found; maybe someone has indicated an attribution to an unsigned painting. All this information can help to identify age and provenance. Condition is of paramount importance. Tears in the canvas should be avoided as they are very expensive to repair and will materially affect the value of the painting. Dirty paintings can be cleaned although this is not cheap. How well a painting has been executed will affect its value but to distinguish between the competent and the accomplished takes experience. If the painting is a portrait look how well the hands have been painted as these are notoriously difficult to do well. Look for depth, good contrasts between light and dark and a balanced colour palette.